Lanyons auctioneer Warren Clark drafting lambs into the EID scanners. Video: Aleis. EVEN Warren ‘Wozza’ Clark’s Richmond cap and commentary couldn’t stop the lambs running for him in a unique demonstration of drafting and electronic tag scanning equipment in the Hamilton saleyards this week. The Hamilton stock agent this week became the first to draft and scan lambs through an EID reader system in a Victorian saleyards when he stood over the race this week. Livestock technology company Aleis demonstrated its newly developed Hamilton draft reader and wireless synchronisation technology on Tuesday and Wednesday at the Hamilton Regional Livestock Exchange. The hardware and software demonstration reportedly achieved 100 percent read rates and accurate pen allocation out of a three-way draft without interrupting sheep flow, and different readers were able to be wirelessly synchronised. The demonstration has allayed some concerns that sheep EID systems might not be able to handle the flush of lambs through Victoria’s major sheep saleyards such as Hamilton, Ballarat and Bendigo. Lanyons auctioneer Warren Clark drafting lambs into the EID scanners at Hamilton. “We ran 69 through and they ran through 10 times, the tenth time they were giving each other high 5s mate. “The ran through, they scanned, that’s fine and I actually ran through a mob of Merino ewes and there is not a problem, but we are yarding 1000 sheep, not 60,000, so the proof will be in the pudding. “I think the general consensus is that that’s the way to do it, on the draft; if there are any compliance issues we can hit it on the head straight away. Mr Clark said the issue ALPA has had from the outset of the decision to mandate EID for sheep and goats in Victoria is “show me the money”, with the EID hardware for Hamilton potentially costing around $250,000. The exact cost of the implementation to saleyards, agents and producers was not know, he said. Mr Clark said he will say how positive he is about the practicality of the EID systems at the end of January after Hamilton has been through the peak lamb turn-off period. Hamilton saleyard manager Chris Dahlenburg said all the feedback on the demonstration was positive. Subject to cost and approval by the saleyard advisory committee, agents and council, and submission of a final plan by October 31, the three-way draft reader system might be installed at each of the saleyards’ seven drafts, he said. Other laneway panel, portable and wand readers were also demonstrated. The saleyard has no EID-tagged sheep coming in, but 120 were tagged for the demonstrations. Different tags were also trialled. Mr Dahlenburg was confident the three-way draft system would enable the saleyard to handle the region’s lamb flush later this year. Aleis/Allflex manager Ben Wilkinson said he was confident the Hamilton reader system would be able to handle the numbers of lambs yarded at Victoria’s major saleyards. “It has just made things a lot easier for everyone straight away. With input from stock agents, the Hamilton readers were placed in extended races leading from a three-way drafting race then into pens as sale lots. Mr Wilkinson said through the use of smart hardware technology and internal software algorithms, Aleis has been able to overcome the cross-reading of tags by nearby readers and demonstrate 100pc read rates and accurate pen allocation. Cross-reading is when an animal’s tag is read by a reader on an adjacent laneway. 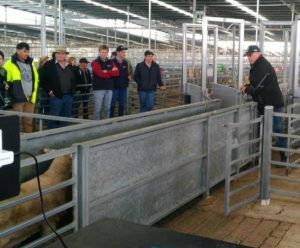 “We were also able to demonstrate over the two days of demonstration that the reading of sheep in this saleyard scenario was able to be achieved without adding any additional time or effort to the processes already in place. “We also took the opportunity to demonstrate the newly developed wireless synchronisation technology developed under a separate research and development project,” he said. Mr Wilkinson said all EID readers within close proximity of each other require synchronising together in order to correctly function. “To date, this has only been possible by the use of fixed cabling between each reader. The wireless synchronisation project was initiated to greatly simplify this requirement and remove significant cost in major installations. “It also allows the use of mobile EID panel style readers in a saleyard environment to be realised,” he said. Mr Wilkinson said Aleis also partnered with Livestock Exchange to demonstrate the hardware offering at Hamilton. Agriculture Victoria’s director for sheep electronic identification Warren Straw said research and development across the state, including at Hamilton, have demonstrated it is possible to scan tags on sheep efficiently without unduly disrupting sales. Transition package funding from the Victorian Government is already delivering impressive results, with the Australian Livestock Saleyards Association co-ordinating and conducting trials, he said. “I’m confident the database will handle them and I’m confident we will have the systems to handle the larger numbers of lambs.